* Alternative crops with high added value: Results from the trees inoculated with ectomycorrhizas were positive. In Ayoó de Vidriales, tests confirmed presence of Lactarius and Boletus mushrooms, which according to calculations can be harvested for the first time in 2018. In San Mateo de Gállego, truffle presence under Holm and Kermes oaks was verified. The potential for truffle production is high as of 2018 or 2019. These results confirm the value added quality of an integral model that incorporates multiple crops and generates new forms of income. * Biodiversity: A significant increase in biodiversity was seen in the production systems as well as a higher resistance in the plants against plagues and diseases. Phytosanitary control is being substituted for biological control thanks to the increase in auxiliary fauna. 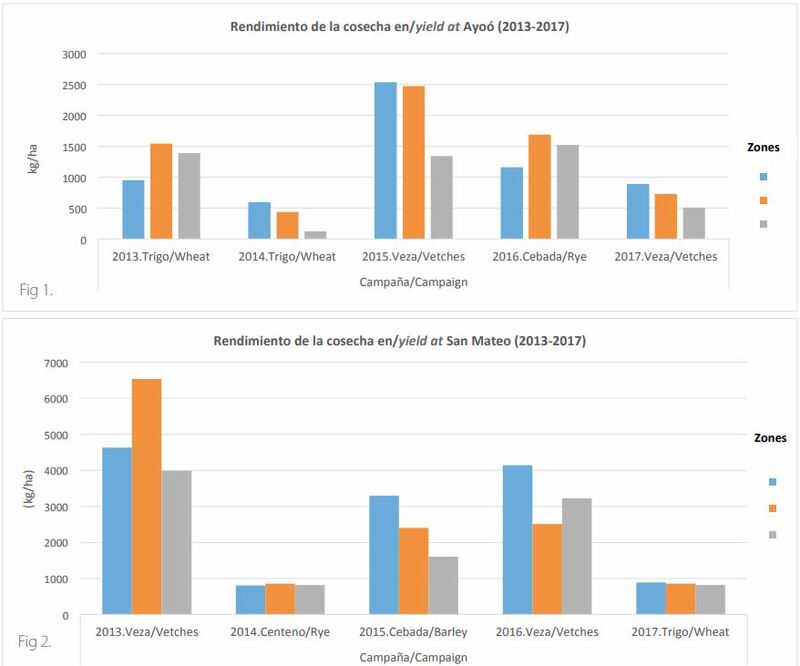 For example, the first appearance of aphids in the herbaceous and woody crops of San Mateo was quickly abolished due to the high levels of predators and parasites that naturally inhabit the cover crops and the border protection plants. This directly benefited the owner of the land who saw a reduction in input costs and time spent treating the land. 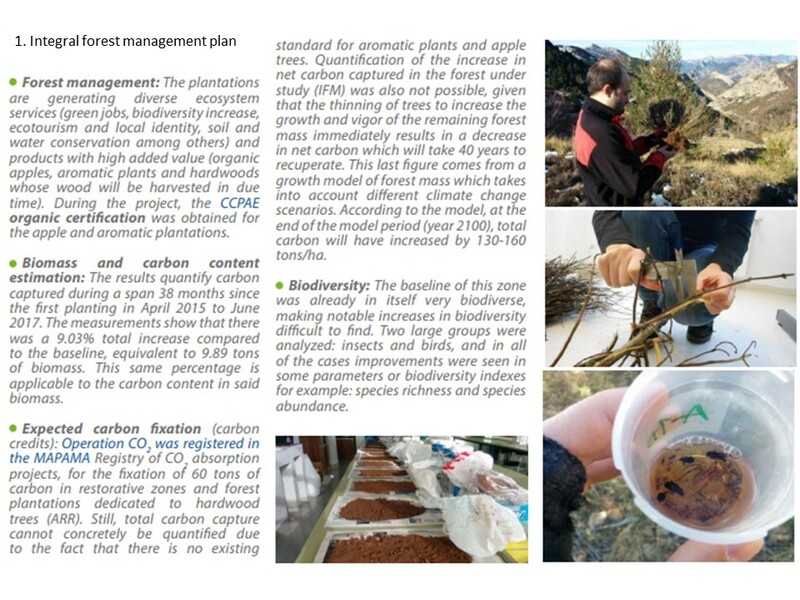 * Carbon analysis: In the agricultural parcels of Area B and C, a baseline biomass of zero was used because there was no vegetation and no carbon capture. Now, due to crop and tree plantations these areas will serve as a carbon sink over the long-term, thereby increasing total carbon fixated. The soil will serve as another long-term carbon reservoir. In this case, the key was not to increase the carbon captured by the soil, instead to avoid losing it. This was effectively done and proven by the measurements taken and compared with the control zones. 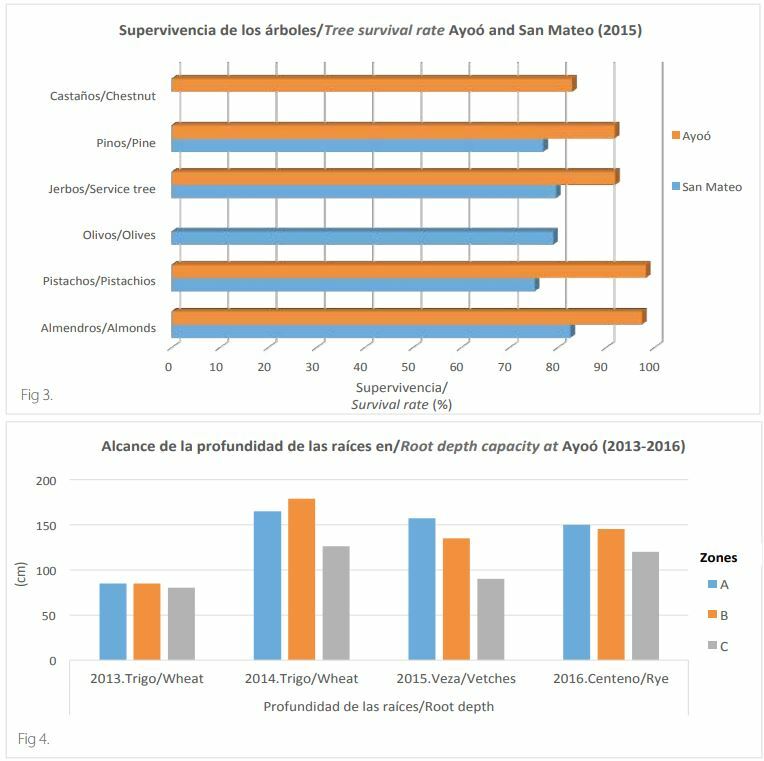 In Ayoó, a 30.5% decrease in soil carbon was avoided, and in San Mateo 6.7-8.9% was avoided. The implementation of an Integral forest management plan in areas of degraded natural forests, contributes in part to climate change mitigation by increasing CO2 fixation and also to climate change adaptation by reducing the risk of possible forest fires, decreasing risk of diseases and plagues and strengthening a systems resilience, all the while enhancing the sustainability of its water use. Agroforestry principles have been successfully applied in two demonstration sites and have demonstrated that in the zones where mycorrhizal and bacteria treatments were combined with sustainable agricultural practices, plant roots grew more and deeper into the ground. This resulted in an increase in yield of annual crops compared with the control zone. Soil characteristics (porosity, moisture) were successfully modified and increases in microbiological activity were made. All of this together resulted in healthier soils and a more resilient system, further reinforced by the introduction of various trees, bushes and aromatic plants. The Zones in which the Integral forest management plan was applied in Muntanya d´Alinyá have been registered in the MAPAMA registry of carbon absorption projects. They have also started a discussion about the problem of double counting of carbon credits in Europe. In this project, carbon credits were considered as an alternative form of income in addition to the mix of plant species harvested including aromatics, bushes and trees, planted as part of an agroforestry system. This system not only increased carbon fixation in the parcels compared to the beginning of the project, but will continue to provide other ecosystem services such as carbon fixation by the soil and a supply of products (fruit, nuts, wood, aromatics) that help to sustain jobs and avoid abandonment of the local village. The systems put in place during this project could give an impulse to the Greening strategy within the CAP payment system considering that a greater variety of crops, improvements in biodiversity and the protection of habitats and water resources contributes to the resilience of soils and ecosystems. The development of a virtual application available on the project website will help landowners to develop their own Integral Planting System, by suggesting potential species and showing example plans of viable crops to plants depending on the type of soil and climate in the region.